It’s party frock season. Thought you might need some inspiration for your New Year’s Eve attire tomorrow night. We can’t all afford these gorge gowns but they will give you some ideas about shapes, proportions and colour. Let’s continue galavanting, shall we? Adding some frou always works – whether it’s in the form of bows, feathers or a little lace. You could take a simpler, white, strapless or sleeveless dress, add a feather boa and maybe a wide, black ribbon tied around your arm or wrist in a bow, borrowing from Monsieur Mabille? And those T-strap sandals? I have a great pair from Nine West so you can get the look without spending a fortune. …or you could just take a regular LBD that’s in your closet and add a lace bag or gloves – easily found in vintage shops – wherever you live. I love the petal effect on this David Dixon dress – plus, it won’t kill your budget like Chanel HC! The next two examples are all about shape. I adore the idea of a jacket and long skirt and lu-uv this silhouette. (Sorry, what’s that? I couldn’t hear you from inside your closet as you look for the similar items you may already have!) I’ve been following David Dixon’s work since the mid-90s and this is a man who knows his clients (and us women!) very well. This dress by Tarun Tahiliani needs its own soundtrack. Of course, you will want the actual dress, but in a pinch, you can take that slinky top you already have, put on the widest and flingiest pair of black pants OR the curviest skirt you own, throw in a statement necklace and voila! You will ring in the New Year with drama! Tarun Tahiliani FW09 dress. Photo by Vinod Kumar. One from my fashion archives from a few years ago - Etro's paisley gown. The colours from Bottega Veneta and Ranna Gill provide nice options if black is blasé where you are concerned. Bottega Veneta gown from the Resort 2010 collection. Ranna Gill's colour blocked column from SS09. This David Dixon frock combines leather and tie-died silk – adding structure and movement all in one shot. And now you social butterflies can have it all – a shorter shift with a longer, chiffon overlay. 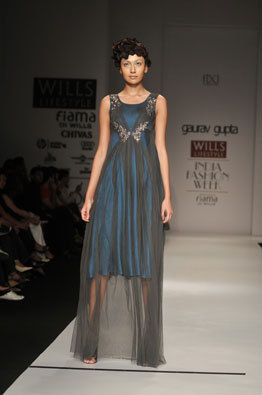 Gaurav Gupta FW09 - the long and the short of evening dressing. Alexander McQueen's green Grecian goddess from FW07. …and this divine creation for Gucci by Mr. Ford – why saunter when you can slink your way into 2010? Sources: Mabille photo from Getty Images, Bottega, Chanel, Gucci, McQueen photos from Style.com. David Dixon photos courtesy of AYM Photography. Gill photo courtesy of Ranna Gill. Tahiliani and Gupta photos courtesy of WLIFW. Etro image courtesy of Neiman Marcus. Next Post Resolution or Revolution? Thanks Puneet – lots more in the works in the coming weeks. In the meantime, be sure to check out the archives as well. Nice Blog………the topics are different and so are the photos. Will visit again.